I posted this look in my Black Friday Haul post but I wanted to do a separate post on the breakdown of the actual look and where you can get similar (if not identical) pieces. 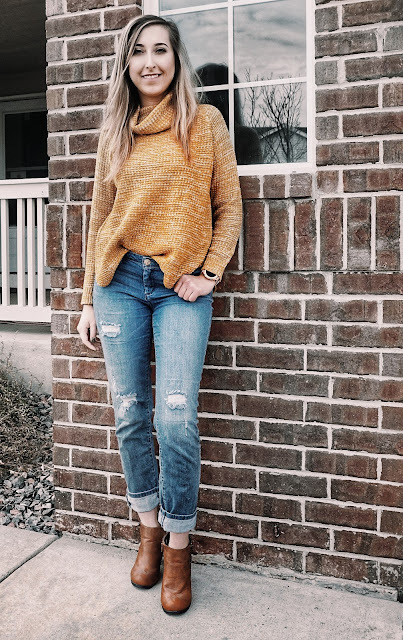 I think this look is super warm and comfy and I wore it all day while I was making our sides! Ever since I got glowing reviews on my mustard colored shirt and how it matched my skin tone, I thought why not buy a few more yellow toned pieces? I actually was able to get this on during Kohl's Black Friday sale and because it's Cyber Monday, you can get it discounted today!! The sweater I'm wearing is this Juniors' It's Our Time Cowl Neck Tunic Sweater in the color 'Butterscotch'. The only reviews online show that this sweater's sizing is off (too small) and I would agree and recommend to size up. I ended up getting an XL only because it was the only size left. I usually wear a Medium and would've normally sized up to a large. The only reason I was okay with getting an XL is because I know it will shrink in the wash and even if it doesn't, oversized sweaters are super cute now. Click the picture to shop some alternative jeans! The jeans I'm wearing are actually LC jeans from Kohl's as well. They are ripped on certain areas but also patched up, which makes it semi-appropriate for work. I previously worked at a place that was not picky with dress attire so they were okay with me wearing these jeans. I wasn't able to find them online any longer but these are super cute alternatives (click here). What I really like is that they have long/tall sizes so they don't cut off at a weird places for me. 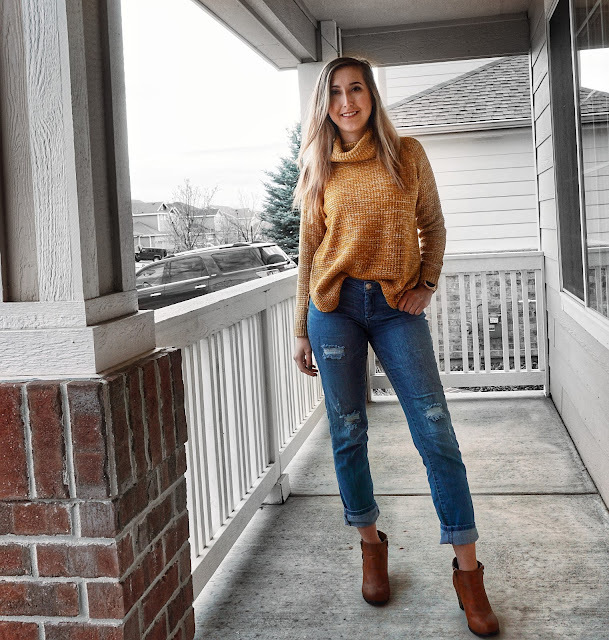 The boots I'm wearing are originally from Rue21 and no longer available, but I found a cute alternative click here (Target) or click here (another one from Target) or click here (Charlotte Russe) or click here (another one from Charlotte Russe). Click the picture to shop some cute alternative boots!